Do we get that control back, when we watch scary films? Is our fear manageable when we’ve volunteered to feel it? Director/writer/editor Charlie Lyne’s latest film, Fear Itself, like Beyond Clueless (2014) before it, takes a film genre – this time the horror film – and examines what draws audiences towards that which scares them. Using dozens of examples, classic (Night of the Hunter) and cult (Tetsuo: The Iron Man) alike to build a picture of the familiar themes and imagery that horror films seem to use endlessly to draw us in. Lyne’s narrator is a woman grieving and traumatised, suffering nightmares but unable to keep from watching the scary films that then feed back into her subconscious. This narrator introduces the key questions at the core of our relationship with the horror genre, opening with the problem of predictability. Most of the time, we know exactly what is going to happen in a horror film, because we’ve seen the same thing in other horror films countless times before, and yet we allow ourselves to be manipulated. Lyne looked at this very problem in his previous short film, Copycat, which took the form of an edited conversation between Lyne and filmmaker Rolf Kanefsky, who’s 1991 film There’s Nothing Out There included a character savvy to the tropes of the horror film, who helps his friends to survive an alien attack. 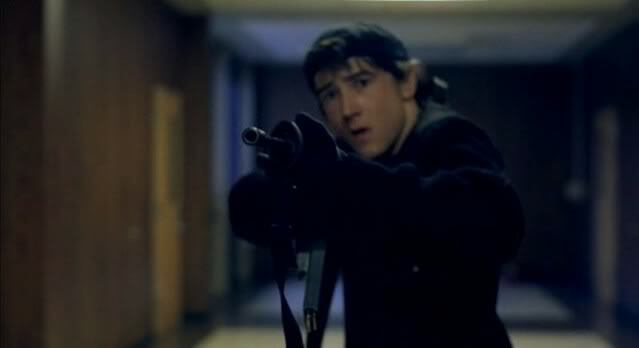 Kanefsky’s attempts to get the film wider recognition put him in contact with one Jonathan Craven, leading to his speculation that Scream (1996) and specifically the character Randy Meeks (Jamie Kennedy) might have a little too many similarities to There’s Nothing Out There, to be a coincidence. Fear Itself is available to view on BBCiplayer.